An interview should always have a positive ending. Here is a list of few important questions which has to be never asked at the end of the interview. 1. When will you get back to me? 2. What about the salary negotiations? 3. Can you brief about the company’s future projects? There are few questions even though your intentions are right might give you a bad image. Never put questions like about the organization’s future projects at all. Because this might show either you are unaware about the organization’s details else it will show that you are unsecured about your job. 4. Can you give me an idea about my working hours? It is very good to know that you are ready to know about the organization entirely. But this does not mean you can demand to know all the details right at the interview date. Questions about working hours, number of leaves and vacations can be asked later but not at the end of the interview. 5. What are the employee benefits which is very unique in your organization? Never ask questions which might make them thing you are too cautious abut your job. Questions like employee benefits, or your leave deductions can be asked sometime later and not at the end of the interview. This might make them think you over indulge with your questions to know about the organization details. 6. Is my boss a female or a male? This question is absolutely a head turner as it shows you are gender biased. There might be some personal choices but it is absolutely wrong to talk to at the interview or even at later stages to someone. This will ruin your image as well nothing is going to change even after you know who is going to be your boss. So, it is better to avoid talk these topics at the end of the interview. 7. What is period for considering a hike in my job role? Every one will be excited to be great at their job to get a hike very soon. But this does not mean you can exhibit your emotions right at the interview. Questioning about the time limit for your hike or about your future improvements is not so appropriate at the end of the interview day. 8. How quick is promotions going among other employees presently? Do not get too much involved to know about their employee performance or professional analysis. Sometimes this might bring you image that you are too judgmental about their company or about their over all working. So, avoid these kind of questions which wilt ruin your respect. 9. What will be my situation in your office if I dislike my colleagues or my team? Every job seeker might have few doubts or insecurities about their job. Or there might be few bad experiences in their previous job. This cannot be explicitly exhibited to the interviewer as they might get confused or suspicious about your behavior in the future. Hence, do not express your fear to the interviewer. 10. Will you consider for an onsite in few years? Another most common expressions of an job seeker is to know about their plans of sending you abroad for an on site. Yes, every one has a dream to work from foreign countries but this does not mean you can ask this question to know about their future plans of your job. This might make the interviewer feel you are so obsessed about leaving to abroad. 11. Do I have flexibility in timings if I finish my job? Its natural no one will want to stay in office, after they finish their job. But this does not mean all organizations will have flexible work timings to send their employees as soon as they finish their job. It is better not to expect these things right at the end of the interview. Even though there are chances about flexible work timings it is good to avoid such kind of questions at the end of the interview. 12. How long have you been here in this office? Job seekers should always know where to limit their questions when they intend to ask the interviewer. Be careful about your questions as few of them might be an introvert or few might not like asking any questions about something personal. There are chances that few of the interviewers might avoid to get too personal to you until and unless your are into their company. So, it is better to avoid such kind of questions since because you are given a chance to ask a question. 13. Why was that downfall happened in your organization last year? It is good that a job seeker should be aware of all good and happenings about inside the company but this does not mean you can get into all topics right at the end of the interview. There might be few questions which has to be reserved for yourself as it might even hurt to discuss with a job seeker. So it is good to avoid embarrassments from both the sides. 14. Are you married or do you have children? Yes again this question might cause reverse actions as it is real not necessary question at this point of time. So,do not try getting too personal to know about their background. Be smart enough to ask what is really needed for the interview point of view. 15. Can you share me your social media details. It is very common that all of us are interested in social media and you are eager to get into touch will the interviewer through social media. But there might be few people who are really away from social media. So, just to avoid these kind of things it is better to stick not to ask something like this at the end of the interview. 16. Tell me when you will do a background check. Background checks are very common procedure followed by most of the organizations. So, it is not needed to ask them this question about their responsibilities. This might also bring reverse reactions like something suspicious about your curiosity about background checks. 17. Can I access my personal mails when I am in office? Every employee will need some personal breaks from the routine in office. And most the organizations does not restrict too much from not taking breaks or checking personal emails. So, it is better to not put this question because your question might trigger them thinking you are more interested in extra curricular than office work. 18. Do I get a separate cabin? Questions about your seat allotment or about having a separate cabin will make them feel that you are a person of comfort zone. Even though you are eager to know about your personal space it is better to avoid these kind of questions at the end of the interview. 19. What is the last possible thing when you will do when a employee does not meet expectations? Every job seeker will want to know what are the firing policies of the organization or how does their organization react to under performing employee. But never put questions about under performance because there are chances you can be misunderstood that you are scared about your future. So, stay away from negative questions. 20. How many job seekers are been interviewed for the same role? Never show you are eager to know about the competition involved for the same job role. This will give a negative impact on you. Be confident about your performance and stick to your interview than knowing about someone else. 21. Is that rumor true? Taking about rumors will always back fire to you. Do not think it might increase the closeness with the interviewer. You will also be judged about your corporate etiquette too in a interview. So, stay away from such kind of questions. There are many etiquettes when related to job interviews. It is always good to stick to be minimal than talking a lot. The more you express, the more you are judged. So, be conscious about what you speak and stick to relevant topics to the interview. 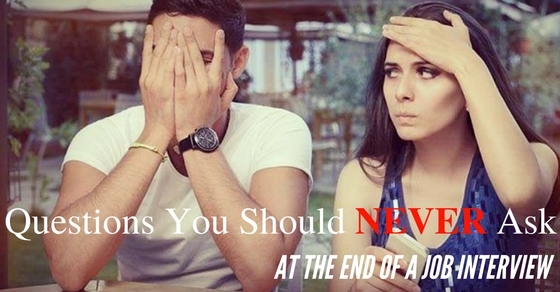 Hope this post helps you to know about the questions which are to be avoided at the end of the interview.